How to make a minimal Halloween wreath for your home with only a few items. It’s Thursday and that means day 4 of our 5 day Halloween Challenge hosted by Sam from Raggedy Bits. So far I’ve shown you gold speckled pumpkins, spooky luminaries and my creepy Halloween mantel. I love minimal decor for my home and also for Halloween I like to keep it simple or on the simpler side. This easy Halloween wreath couldn’t be more that. Prepare your surface, preferably outside, with a dropcloth or old towels. Spray paint the wooden ring and faux red berry branch using black spray paint & let dry. 3. Attach the branch to the lower part of the wooden ring by wrapping both ends around it. You’re done! It really doesn’t get easier than this minimal Halloween wreath and I think it looks great against my white cabinet. It really adds a little bit of mystery and spookiness to the decor, don’t you think?? And that is day 4 of our fun challenge! Hop over to see what Sam came up with & have fun!! Also, be back tomorrow for our 5th and last day of the Halloween Decor Challenge! Thank you for visiting, have a lovely day! 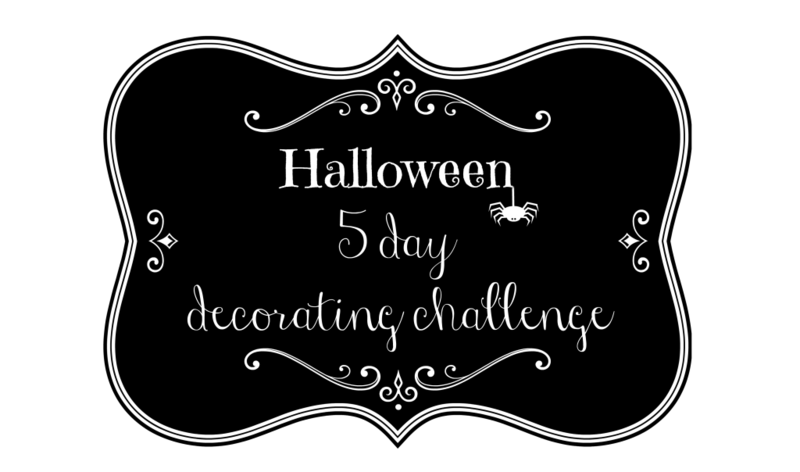 Welcome to Day 4 of our fun Halloween 5 Day Decorating Challenge! Oh my!!! What a fabulous idea!! I would never have thought to spray the pip berries black!! So clever and I just love your wreath hanging on your cupboard Katrin! !